It may seem simple, but ensuring you have enough boxes and the right kind of removal packaging for all of your belongings to fit in is one of the easiest ways to take the stress out of moving day. All good removal companies prefer that your things are packed in boxes rather than bags. Boxes are easier to stack inside the van, which makes better use of the space and lowers the risk of your things moving and becoming damaged during transit. Bags can also develop holes or tears and may lose items – this is why Van Man York recommend the ideal removals and house moving boxes and packaging for your removal job. Cramming everything into bags is not really an answer; it makes it very difficult to stack the van correctly and almost guarantees stuff will spill out during transit. Moving home is stressful enough without that as an added worry. Save yourself stress and time by making sure you have enough boxes and packing as many items as possible in them. Boxed items are far easier to move and a great deal easier to stack. It helps ensure that the available space is used as efficiently as possible. Unboxed items are hard to stack and take up more space – which might mean we need to make an extra trip costing you more time and money. Where Do I Get Boxes? 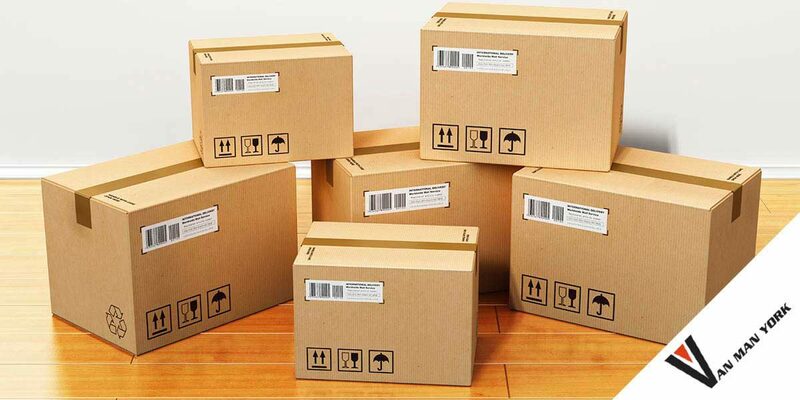 You can pick up removal boxes cheaply from any number of suppliers. A lot of places supply dedicated removal packs including boxes, bubble wrap, tape etc. We recommend Teacrate Packaging who can supply you with all the items needed to make your move as stress free and smooth as possible. Check out their website for a list of discount moving packs. Their removal packaging supplies are some of the sturdiest available and we alwasy recognise Teacrate Packaging when we arrive on a job if their boxes and packing has been used. Make sure that breakables such as cups, plates, vases etc are wrapped in something protective such as bubble wrap or stuffed with newspaper to protect them from knocking against one another and chipping or breaking along the way. There’s not much point saving money by not buying bubble wrap if the result is a box full of bits of a Wedgewood tea service. Also make sure that boxes aren’t overloaded or already damaged to start with. If you use plastic containers with lids, make sure that the contents are not poking up over the sides so that the lid can be closed securely. Remember to place heavier items such as books in the smaller boxes and light items in the larger boxes. If you’re not looking forward to the daunting task of packing and unpacking, let Van Man York help, we offer a dedicated packing and unpacking Service tailored to suit your needs and budget. We can supply one member of staff or many packing and even cleaning staff to help with your house move or business relocation.